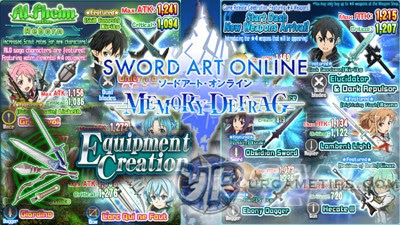 Here's a list of One-Handed Maces/Clubs and their stats, weapons that is currently available in the action RPG mobile game - Sword Art Online: Memory Defrag. Maces and Clubs are for melee class units that can also be used to Parry enemy attacks. 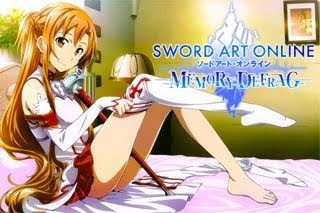 - You may only buy up to 4* weapons from the weapon shop. To reach [R5], you need to get 4 copies to upgrade your [R4] weapon (applies only to weapons that can be upgraded to 5*). - Chances: [R4] weapons = 4%; [R3] weapons = 25%; [R2] weapons = 71%. - List above will only include weapons that can be upgraded to 4* and 5*. Farmable weapons from the Story Mode are ok, if you don't have any better alternative at the moment. - To sort the table, click/tap on the headers. - If for example, you equip a Fire element weapon to any character under the Fire element, that character's weapon will get a +20% bonus stats. - BS1 = Can be unlocked once you reach [R3] (note: [R4] for event weapons). - BS2 = Can be unlocked once you reach their Max Rarity (except event weapons). Also note that [R2] weapons from shop won't get a BS2 even if you evolve it to [R4]. - Some featured Gacha Weapons will instantly get 2 BS Skills, refer to R4 weapons above if they already have 2 BS. - Equipment that has been upgraded to it's maximum level can be evolved at a smithy by using Col and either equipment with the same name or evolution ingots. Evolving equipment will reset their Lvl, but will increase it's rarity, stats, max level, and more. - Max Lvl 20; Requires 2 Copies (same name) regardless of Lvl. - Max Lvl 30; Requires 3 Copies (same name) regardless of Lvl. - Max Lvl 40; Requires 4 Copies (same name) regardless of Lvl. - You can now trade 4 unevolved R4 Weapons to get a Weapon of your choice. - Exchange Market: you can now trade farmable items for limited gears like weapons and accessories. The Market can be accessed via Menu > Exchange Shop. - Note that you can view the next MAX stats and new BS info of your fully maxed weapon via the "Evolve" option when visiting the smithy.